Q: Why is ventilation so important? 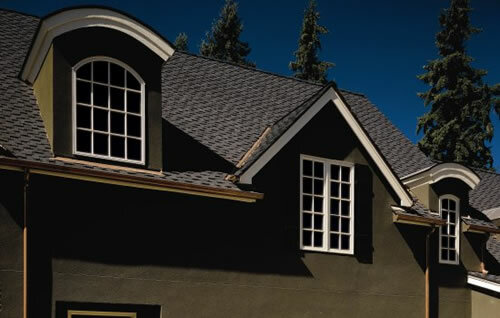 A: Ventilation is a crucial factor in the life of a roofing shingle. Heat build-up in the hot summer months, as well as the cold weather of winter will accelerate the aging process of your asphalt roofing shingles. Proper air circulation, regardless of the weather outside, will greatly reduce the chances of leaking, blistering, distortion, curling, rotting of wood structure, wet insulation and many other potential problems. It is also important to note that adequate ventilation is required to validate the shingles manufacturer warranty. In all cases, the most stringent applicable building codes must be followed. Q: Why are there sections of my roof where the roof shingles are buckling or puckering? Moisture build-up in the attic can cause wetting & drying cycles in the roof shingles. Improving attic ventilation can prevent this. Installing wet shingles on a dry day, or dry shingles on a wet day will almost guarantee the appearance of fish-mouthing. Nails that are ‘popping’ out can also cause fish-mouthing. Simply correct the position of the nail. Q: Why are the corners of my shingles turning up? A: Corners of shingles turning up is referred to as Curling and it is generally caused by excess moisture attacking the underside of the shingle. Inadequate ventilation causes the entrapment of heat and moisture in the attic. This will eventually penetrate the roof deck and cause the shingles to curl. Improving air circulation within the attic space can stop the progress and rectify the situation if the curling is not too severe. In some rare instances, curling can reveal itself only under cold weather conditions. This would be refered to as winter curling. The corners of the shingles will slightly curl up from the roof deck when cold, then lay flat again during warmer weather. This is especially prevalent during damp winter conditions when frost forms on the top surface of the shingles. This cooling on the top surface will cause the shingle to contract while at the same time the underside of the shingle in contact with the roof receives a certain amount of passive heat from the attic space. The variation of temperature between the top side and underside of the shingle will result in some minor curling. This does not affect the shingle’s durability and effectiveness to shed water. Q: Why are my shingles doing the wave? A: Buckling shingles can become humped or wavy, usually running in a straight line up, or across the roof. Improper nailing – nails will ‘pop up’ creating the buckling effect. Q: What are the black streaks on my roof? 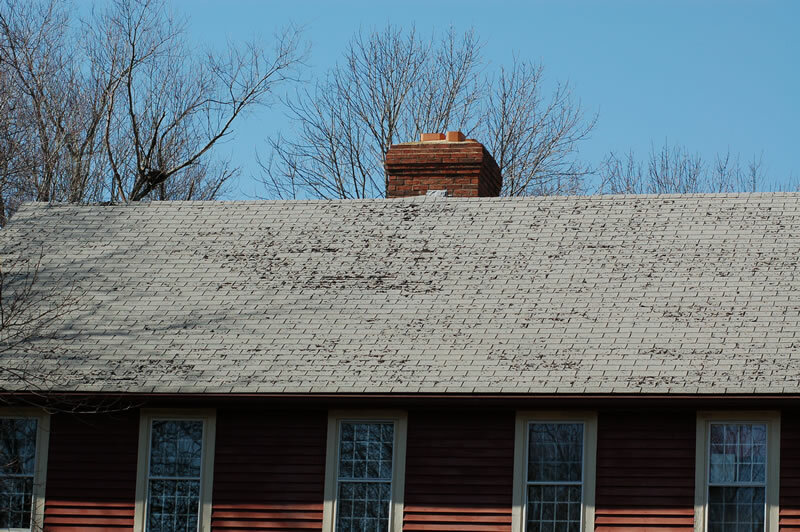 A: Usually visible on North-facing light-colored roofs ranging from five years old, discoloration or streaking is sometimes mistaken as dirt, moss, or granule loss. It is actually caused by algae growth that propagates in areas of the roof that receive less direct sunlight, and thereby retain a higher level of moisture. Although most noticeable on light shingle colors, the algae affects all asphalt shingle roofs, including darker colors. The discoloration caused by the algae is in no way indicative of a shingle defect. This is an aesthetic concern and will not harm the shingle or shorten the life of the roof. The algae discoloration is difficult to remove from roofing surfaces, but may be lightened using various solutions available at most lumberyards. Q: What is making my roof leak? A: Leaking roof: Normal weathering of asphalt roofing shingles will not cause leaking. Q: What are the aging signs in shingles? A: All shingles, whether organic or glass based, will be subjected to UV rays from the sun, causing the asphalt coating to dry, loosening the granules covering in the long run. Other visible signs are pieces of torn shingles, curled tab corners as well as center-line cracks.